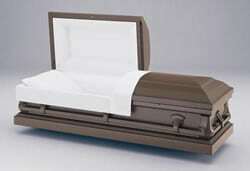 Our traditional burials begin at $4,495 for a complete service with 20 ga steel caskets. 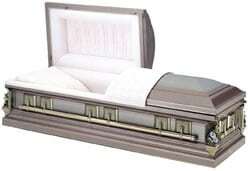 Prices increase accordingly for more expensive caskets. A funeral bill is the third largest lump-sum expense you will face in life, after a mortgage and an automobile purchase. Consumers purchase a car more often that they arrange for a funeral, therefore the public has no clue as to reasonable funeral costs. If possible, comparison shop for funeral charges, just as you would for a new residence, a new car, or any other expensive item in your life. There are too many funeral homes out there that want the consumer to be ignorant about funeral costs; to be unaware of available options. The average funeral cost today is $7,500.00, according to the National Funeral Directors Association. That is the average amount spent by consumers for professional services of the funeral home, casket and vault. It does not include cash advanced items, such as cemeteries charges, flowers, newspaper obituaries, and copies of death certificates. Cash advanced items would add approximately $1,800 to the bill. We offer a special funeral service package for $4,995. This includes complete funeral services and the 20-gauge steel casket of your choice. This package was designed due to 2 factors: 1) There are some folks out there who simply do not have $7,000 or $9,000 in their pocket for funeral expenses, or do not have any life insurance, and 2) a growing number of consumers who see no value in funeral merchandise. An expensive casket is of no appeal to some people. The $4,995 funeral service package is perfect for some folks. There are still a vast number of families who want nothing but the very best for their loved ones. We will obviously provide families with the most elaborate of merchandise, whenever desired. We have provided families with a $35,000 solid gold-plated casket in the past, and will do so again if called upon. We offer three levels of cremation services: Direct Cremation, Cremation with Memorial Service, and a Traditional Funeral Service Followed by Cremation. At The Webster Funeral Home, we offer caskets in all price ranges, from the most economical to the most elaborate. For example: Some caskets, referred to as "protective", have a rubber gasket which allows the casket to be sealed from the entrance of air and water. We offer caskets ranging in price from the most economical ($600.00) up to the most elaborate (gold-plated $35,000) and everything in between. 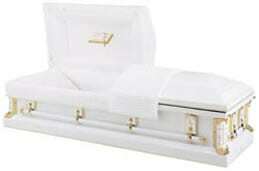 Burial vaults also range in price from $700 for the most basic up to $11,000.00 for the most elaborate. We offer quality steel, copper, bronze, and hardwood caskets in all price ranges. 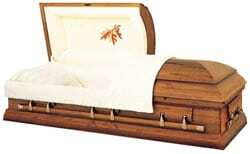 The price of a given casket is determined by construction materiel, interior, and exterior hardware. Casket interiors are composed of different grades of crepe up to the most lustrous velvets. Exterior hardware and other adornments can also add to the cost of a casket. 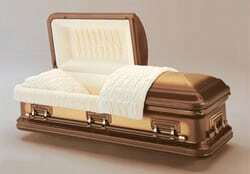 The price of a casket depends on the material from which it is made. 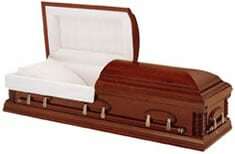 Steel caskets are constructed from 20 ga. steel, which is the thinnest, up to 16 ga., which is the thickest. The thicker the steel, the more expensive the casket. 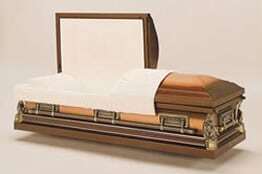 Wood caskets are constructed from the most inexpensive of woods, such as pine, to the most elaborate, such as mahogany. Hardwood caskets are probably the most beautiful and warm in appearance and are produced in a great number of varieties from solid cherry, oak, and mahogany. Semi-precious materials, such as stainless steel, copper and bronze are also available at a premium price. Solid copper and solid bronze caskets were once reserved for the very wealthy, however, such a casket today can be purchased for under $4,000.00, if desired. Copper and bronze do not rust, and such material is utilized in everyday life for gutters and downspouts on upscale homes, for example. Burial vaults are concrete structures required by most cemeteries to surround the casket to keep the grave from collapsing, and also to keep the elements of the grave from touching the casket. Vaults can be purchased for as little as $700.00 for the most basic and up to several thousand dollars for ones that are lined with copper or bronze, which affords the ultimate in protection. Cremation urns range in price from $100.00 for the simplest up to $4,500 for urns that are works of art crafted from the finest materials. The average urn selling price is usually about $500. We also provide register books, memorial folders, thank you notes, photo collages, and video memories DVDs at a nominal cost.